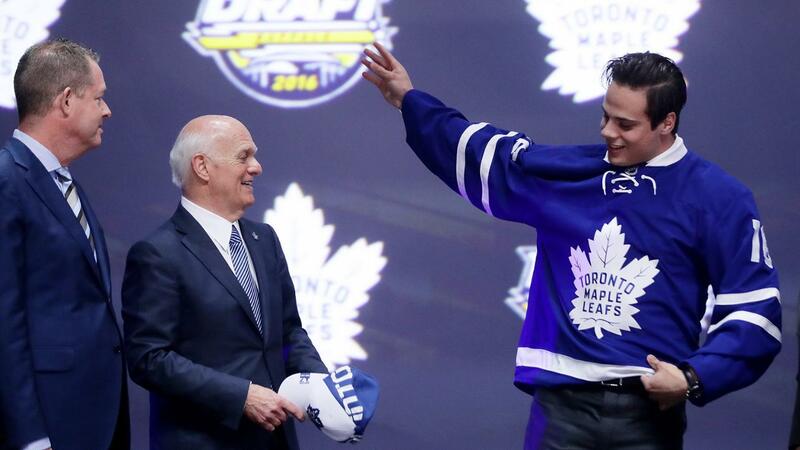 During the rebuild, the modus operandi of the Toronto Maple Leafs has been to acquire as many drafts picks as possible – using the strategy that the more lottery tickets you have, the more likely you are to hit the jackpot. The team added 20 players to the prospect pool over the past two drafts and as of today sit with another seven picks at their disposal. Given that the team doesn’t have a pick between 50 and 110 – the 3rd rounder goes to Detroit as compensation for Mike Babcock – I wouldn’t be at all surprised to see the Leafs trade back from one of their first two picks in order to acquire a couple extra. Last week, I took a look at some potential targets for Toronto’s first round pick, now here is a look at some names that could fit in nicely with the rest of the picks. I’ll start this off by saying that there are players I prefer for the Leafs at #17 – Kailer Yamamoto & Ryan Poehling chief among them – but there are those around the OHL that are convinced both Mark Hunter and Kyle Dubas are very high on the big defenseman, so I will differ to the people who are smarter than I am. With that said, I think Hague would be a very good pick at 17 – just not my ideal one. He’s 6’6″, 215 lbs and skates very well – not just for someone his size. He can lead the rush, he plays with an edge and he has a cannon from the blue line – Nic Hague is the kind of prospect NHL coaches drool over. So why isn’t he a lock for the top-5 in the draft? It’s all between his ears. Nic Hague has all the physical tools to be an elite defender at whatever level of hockey he plays. The issue is that he seems to lack the instincts and mental discipline to take full advantage of them. He makes mistakes positionally and doesn’t react with the kind of quickness you see from elite guys. His size allows him to make up for these mistakes in junior, but they won’t hide the issue as well in the NHL. Don’t get me wrong, Hague is very good and would instantly become Toronto’s top defensive prospect. He is going to be an NHLer – it’s just a matter of how good he can be. He might not be the top-pair guy some predict, but if Hague turned into a second pair guy that is a threat on the powerplay, that’s quite alright for #17 in this year’s draft. There aren’t many prospects that have seen their draft stock rise this season as much as Josh Brook. The Yorkton, Saskatchewan native doesn’t turn 18 until a week before the draft and he has already shown that he can be one of the best defensemen in the WHL. Brook is one of those guys that won’t get a whole lot of attention until he’s making a huge impact in the NHL and gains the “how did they find him in the second round” label. By the end of the season, Brook was on Moose Jaw’s top pair and was playing on both of the team’s top special teams units. Draft him now, be thankful for the next fifteen years. Here is a more in-depth look at Josh Brook’s skill set. After being passed over in last year’s draft, Steenbergen spent this season dominating the WHL. In a similar situation last year, the Leafs spent one of their picks on Adam Brooks – the difference is that Steenbergen showed a huge leap in his development a year earlier than Brooks. There is no way Steenbergen gets passed over in the draft a second time. His 51 goals put him second in the WHL in scoring this season and was good enough for him to be named a second team all-star. Though only 26 of his goals came at 5v5 – top-10 in the league – his fifty 5v5 primary points were good enough for fourth in the WHL. Steenbergen is a good skater with average size and enough defensive awareness to stick at center as a pro. He has a great shot and is an effective puck distributor. He’s a long way from being a blue-chip prospect, but Steenbergen would add some much-needed depth down the middle for the Leafs organization. Kvasnicka is a highly skilled puck-moving defender that has already played half a season in the top Czech professional league. As an under-aged player, he only saw the ice for one game at last year’s World Juniors, but when it came to the U-18 this spring, he was probably the Czech’s best player. Kvasnicka is a smooth skating, undersized defender with strong positional awareness. He anticipates the play well and shows impressive poise and patience for a young defender. A stick on the puck defender in his own zone, Kvasnicka’s lack of strength limits his ability to be an effective physical presence, however, it doesn’t stop him from being aggressive. He is eligible for the CHL Import draft so there’s a very good chance and NHL team would want to bring him to North America next season to take the net step in his development. The last time the Leafs selected an Arizona native in the draft it turned out pretty well – why not try again? Kastelic is born, raise and developed in Phoenix – playing in the Jr. Coyotes system. HIs offensive numbers won’t jump off the page at you, but they aren’t horrible when you consider he was playing on a team that struggled to score goals and spent most of his time on the third line with very little powerplay time. He’s 6’3″ 205lbs and knows how to use his size. He’ll throw his body around, create battles against the boards and cause havoc in front of the net. He moves around the ice well and definitely has the balance and speed to play a bottom-6 forechecking role in the NHL. He’s a project that would have time to grow and could very well turn into a better version of Frederick Gauthier down the road. He’s the youngest player in the draft and as a result, whoever drafts Castleman is going to do so with the idea that he’s got a more room to develop than most in the class. Playing mostly on the wing this season, Castleman made the most of the opportunity he was given. Sixteen of his 18 goals were scored at 5 on 5, putting him 15th among draft-eligible OHLers ahead of Robert Thomas, Morgan Frost and Alex Forementon – all guys that are expected to be drafted in the top-60 of the draft. He’s a good forechecker with a quick release and an underrated ability to create his own scoring chances. Next season will be a big one as the Ice Dogs will need him to be the secondary scoring option behind Akil Thomas. I expect his point total to climb significantly and if he were a few days younger, he’d likely have lot more buzz as a 2018 draft prospect. This is a swing for the fences pick – and admittedly warped by my own bias. Burt is a guy what likely won’t get drafted in this year’s draft – but maybe he should. After being selected in the first round by Kingston, he was traded to Oshawa where he was expected to play a middle-six role and contribute more offense than he has. When you look at his EliteProspects page, you see a guy that looks like a run of the mill bottom-6 OHLer that is destined for University hockey when his career ends. But when you watch him play, there’s something about Burt’s game that screams professional hockey. He is a good skater and a very aggressive forechecker. He plays well down low in both ends and provides great energy and disruption to a shift. When you get to the 200s, drafting for a potential fourth line guy isn’t the worst thing. Burt will likely get passed over, but with a good season we could see his name again in late round next year – it might be prudent for the Leafs to take a chance on him a year early. Previous 2017 NHL Entry Draft: Who Could the Montreal Canadiens Select with Each Pick?